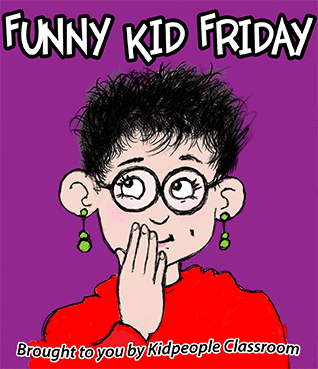 Okay, so Happy Friday again! This is another post, the real post, for this Friday. 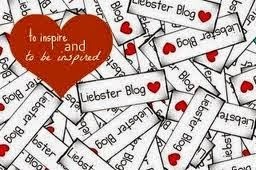 You know with me it either NEVER rains, or it POURS when it comes to blog posts. 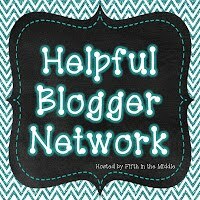 Oh, to be one of those bloggers whose life never interferes with their posting schedule. 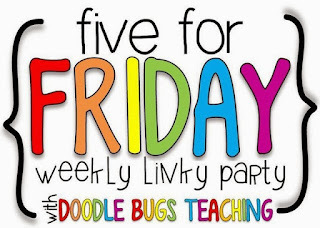 Thanks to Kacey at Doodle Bugs for Five for Friday. Here's five. 1. I have often said that I should have been born an octopus. Between needing to rein in hold little children and carry seventy two LOTS of things to school everyday, I could always use more arms. Here's me coming to school the other day. Can you relate? 2. The day I was schlepping all that stuff was my teaching assistant's last day. She was only there to help launch the school year.... waaawwwww! I wish it could be all year. 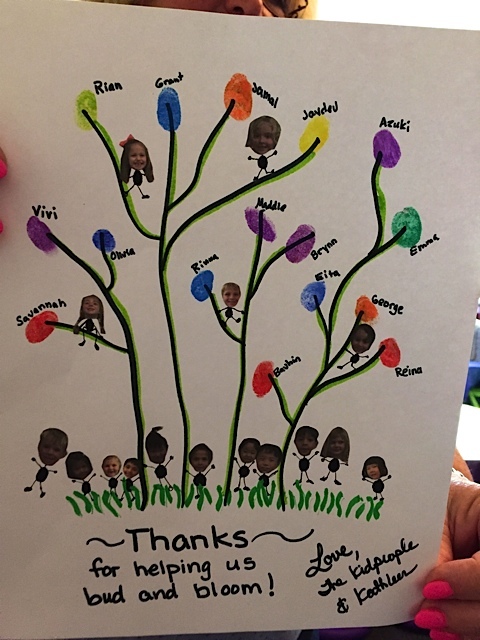 The kids and I made her some special little momentoes– the kids made cards and I put together a piece of special artwork... I use the term artwork loosely. I wanted the kids to be featured. I share it to give you some ideas for your own goodbye gifts. Yes, it took a while to cut out all those little heads, but I think it turned out pretty cute, and she loved it. It will hang in her home office. We miss you, Chris! 3. 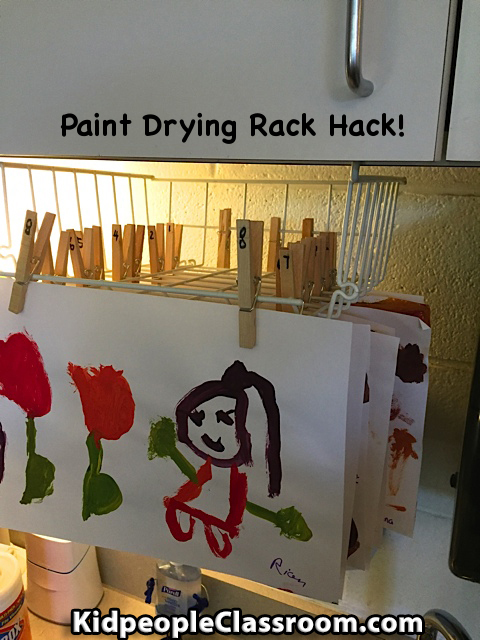 Did you see my earlier post about my Paint Drying Rack Hack? 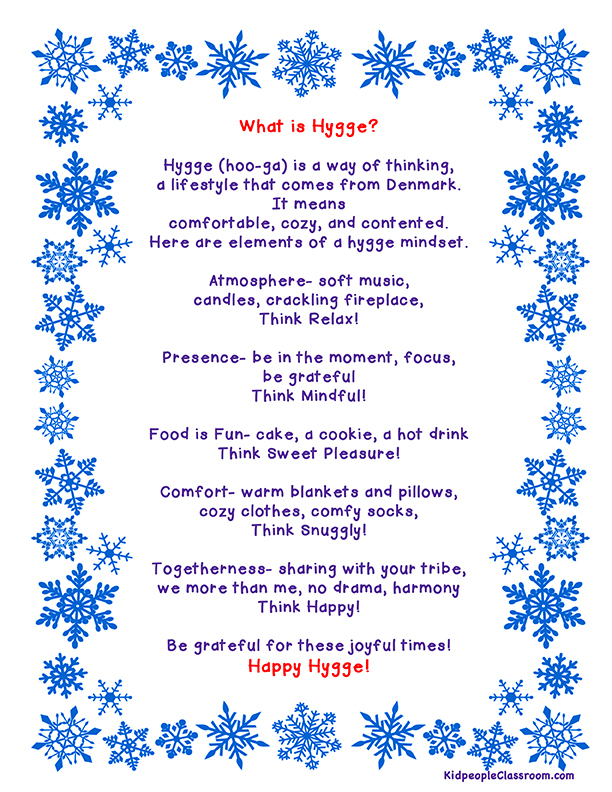 You can see and read about how it works if you click the picture. 4. Okay, now this is the REAL purpose of today's post– a new favorite book review! 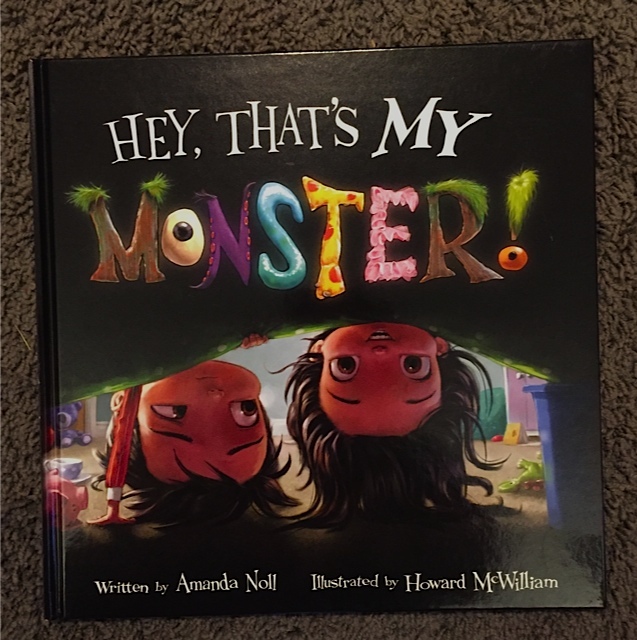 Amanda Noll and Howard McWilliam teamed up again to create Hey, That's MY Monster! Hey, That's MY Monster is a companion to I Need My Monster and furthers the adventures of Ethan and his monster, Gabe. This time Ethan's little sister Emma joins in the fun. What is going to happen when Gabe has to make somebody else go to bed? 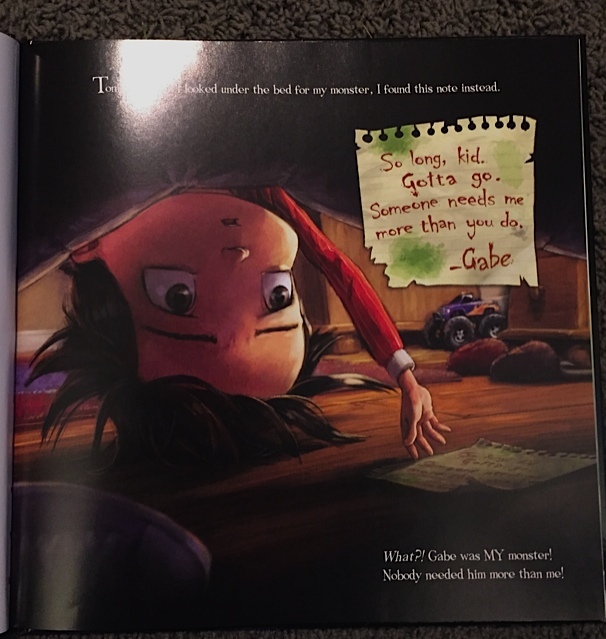 Everyone needs their own scary monster to help them go to sleep, but why does it have to be Gabe?? Great illustrations accompany this monster tale, from cover to cover... 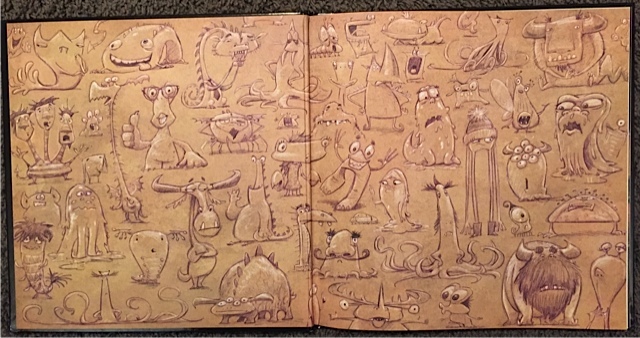 I mean LOOK at this fresh crop of end paper monsters... monster drawing lesson, anyone? There's just the right amount of shiver to hook five year olds right in. We read it fifty seven many times, with "Again!" following every reading. I am always interested when books strike just the right note with the Littles and this one does. 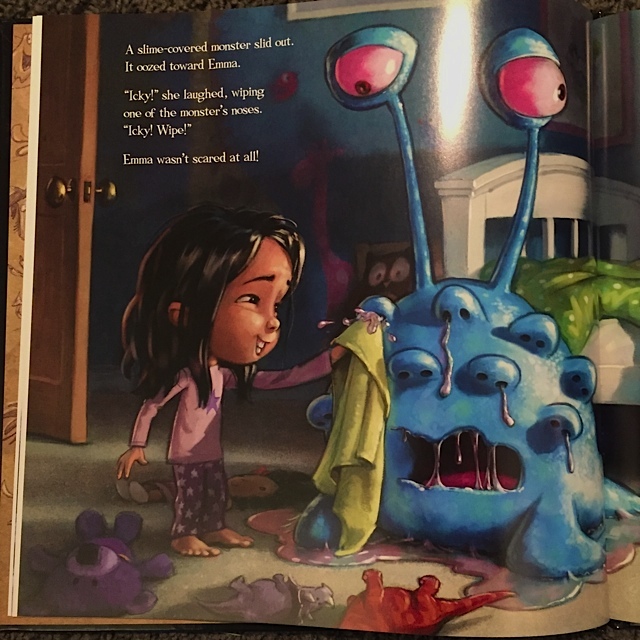 Going to bed in the dark, with monsters or without, is a fear that is pretty much universal, and this story helped the kiddos deal with that fear in a lighthearted way. 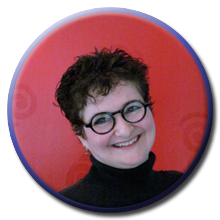 You can read two posts on the first book, I Need My Monster here and here. 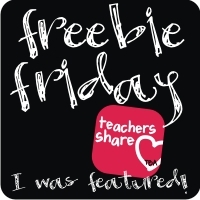 The posts contain a freebie to use with the kids and a link to a neat video. 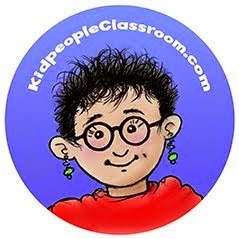 Some classrooms do monsters only at Halloween, but in my classroom, monsters are regular characters in our daily drama. Our favorite monster puppet Ten-Ten Twenty helps us do math (click to read previous post) The rest of the monster gang provide good sports when we need to act things out– little monsters CAN be naughty, you know, SORT OF like five year olds. I highly recommend both I Need My Monster and the new Hey, That's MY Monster. I thank Flashlight Press for sending me the review copy. I can honestly say it is adored by my monster loving kidpeople AND their monster loving teacher, too!! You can check out both books at your favorite bookstore and Amazon. 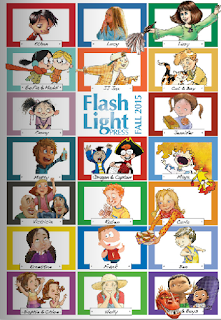 You can see a complete list of Flashlight Books by clicking below. 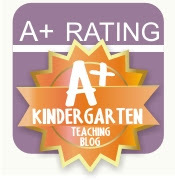 They are a consistently high quality publisher and every teacher should know about them. "We've been learning about all sorts of leaves in our classroom, haven't we? Can you tell me what kind of leaf this one is?" Her kiddo was thoughtful for a moment then said, "Dead." 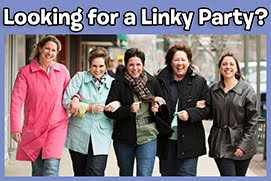 A quick, gleeful glance exchanged between us two adults said it all, "The kids are the best part of this job!" 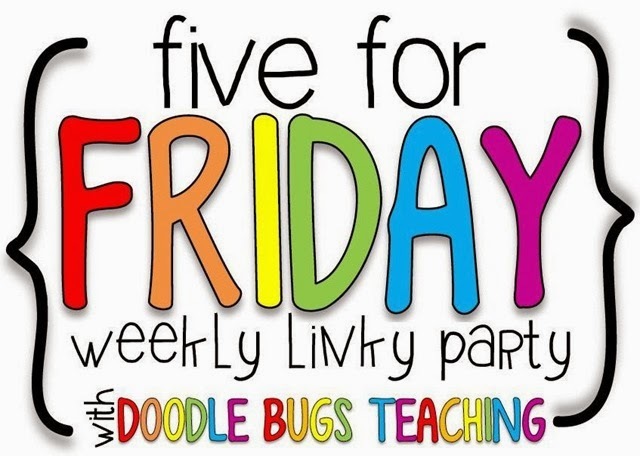 Click on back to Doodle Bugs for more teacher news. And if you hoped over from Small Victories, take a leap on back to continue reading this week's favorite posts! You are the cutest with the pumpkin in your hood! I am totally stealing that paint drying hack, genius! Love the keepsake you made for your helper, so sweet! Love your kid funny, they make it all worth it. 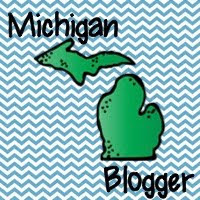 (I realize I say love a lot, but it's true) I've been a bad blogger so I'll just tell you my kid funny, since I don't know when I'll get to a post, lol. We were in centers and I hear my aide say...J**** you are supposed to roll the dice not yourself, we both were trying to contain our laughter. The best part is 10 minutes later her partner says, J**** you're rolling yourself again. HAHA! Gotta love kinders! Have a great weekend!